Oh. Migawd. Why? Why? Why? If you ever doubted there was a war on women, just go have a look at what they’re showing in the stores that offer moderate price points to the average woman. Unattractive. Poorly cut. Terrible material. Overpriced! I feel like these clothes are designed to make you feel as bad about yourself as possible while simultaneously creating an unappealing silhouette. It doesn’t help that the trimmers creating the wall and mannequin displays are clearly in need of more training, but there is only so much gilding the turd one can do. All pictures were taken in the span of about forty minutes, in two different mall anchor stores, in the misses’ sportswear departments, in their on-season, non-clearance sections. You people are making this blog thing way too easy on me. Not that I’m complaining, mind you. Just stating a fact. And so, with no further ado I give you…the Summer of Why. If you MUST wear this (though I can’t imagine why), don’t tuck in your shirt. 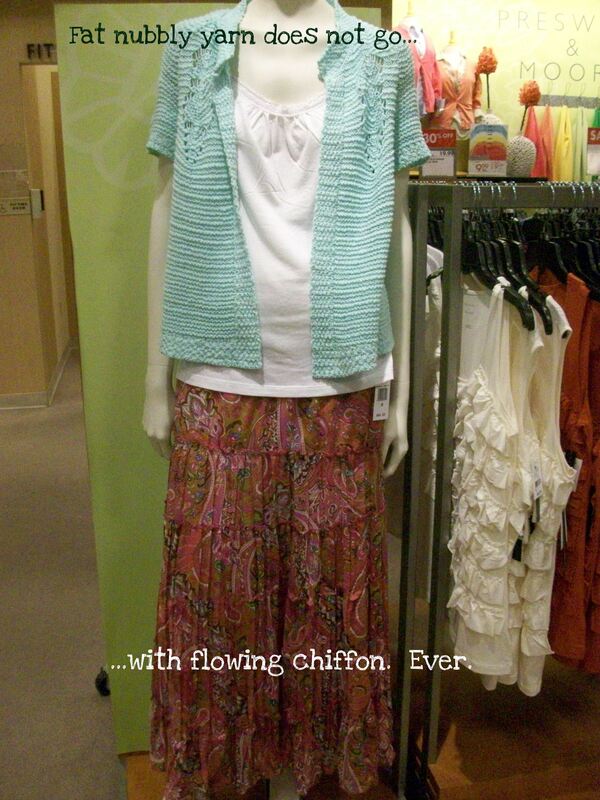 It abbreviates the flow of the outfit and makes you look short-waisted. And not a little dumpy. 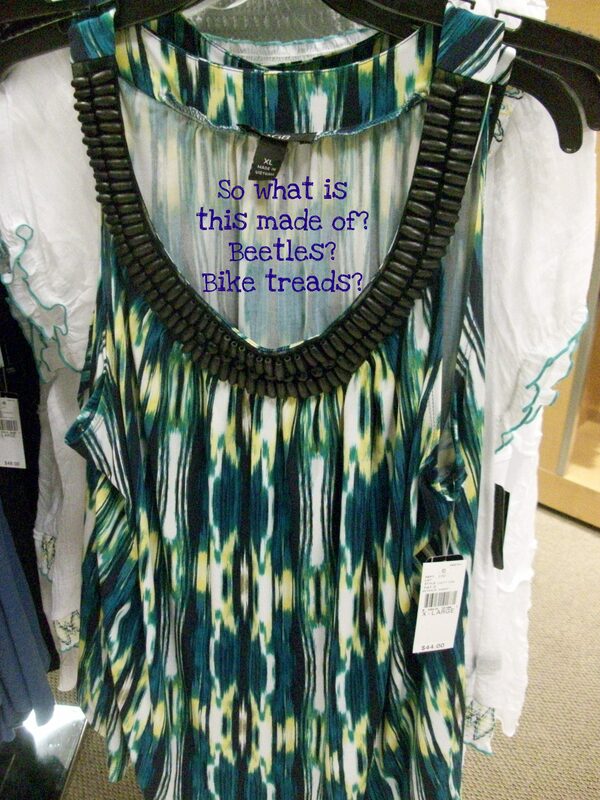 Here’s a better idea: Just don’t wear this, because it opens so many pathways to wrong. Oh, Liz. I expected better of you. 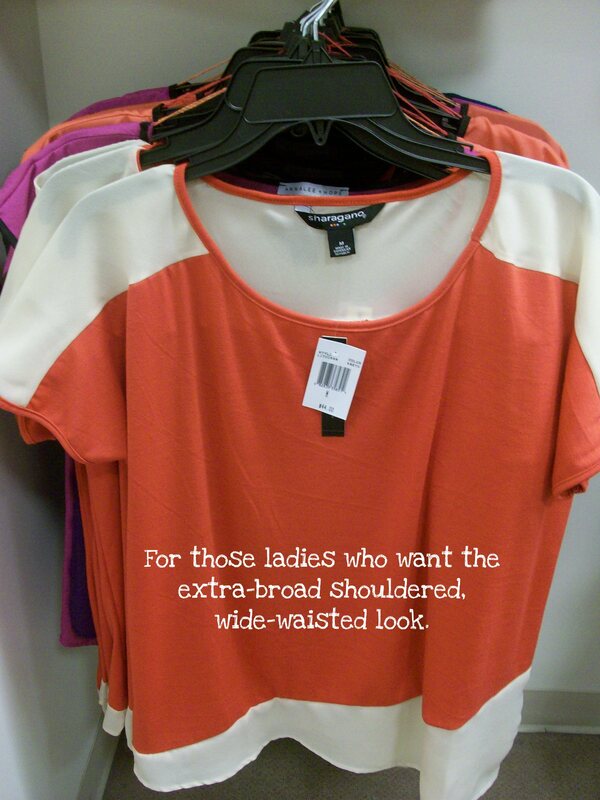 I don’t get why shapeless shirts with visually widened shoulders have become all the rage. Tasty. Casual wear, or scrubs? 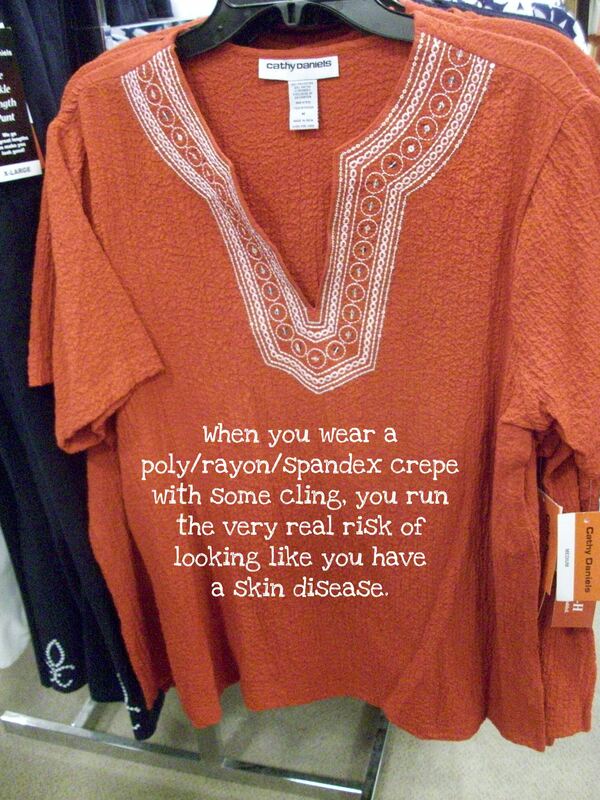 There were an abundance of shirts that were universally unflattering. 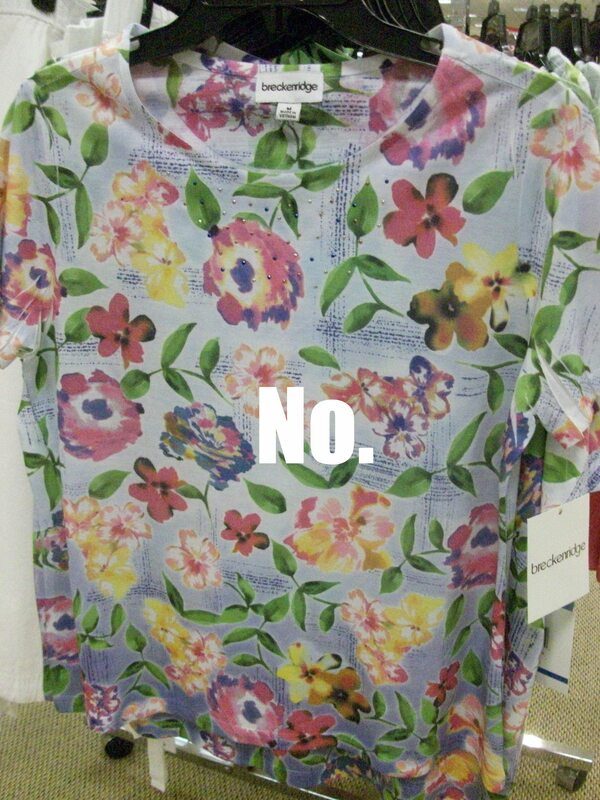 Ladies, you owe it to yourselves to not view this shirt as acceptable. Just because it’s in a store doesn’t make it OK. True story: my boyfriend just turned to me and asked, “Wait…that ISN’T sleepwear?” Ladies, he thinks it would be OK for me to have a nightly drool in these shirts. Put the hanger down and back away. 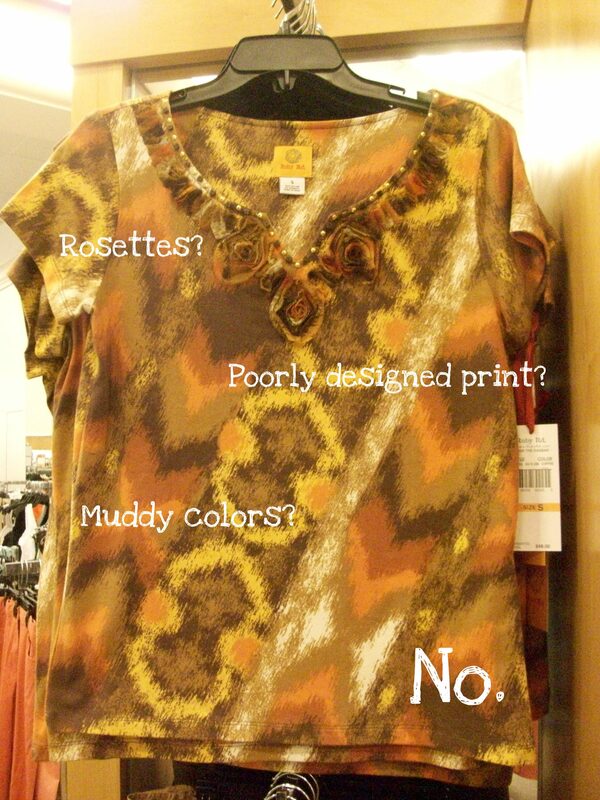 I kept on encountering more and more bad patterns and design everywhere I turned. For comparison, you can find a melting movie reel here. 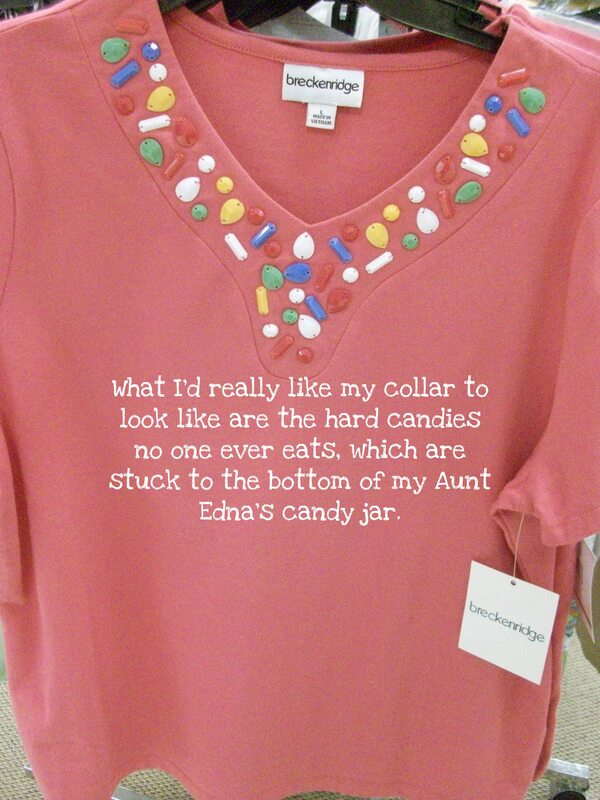 This shirt is just unpleasant. 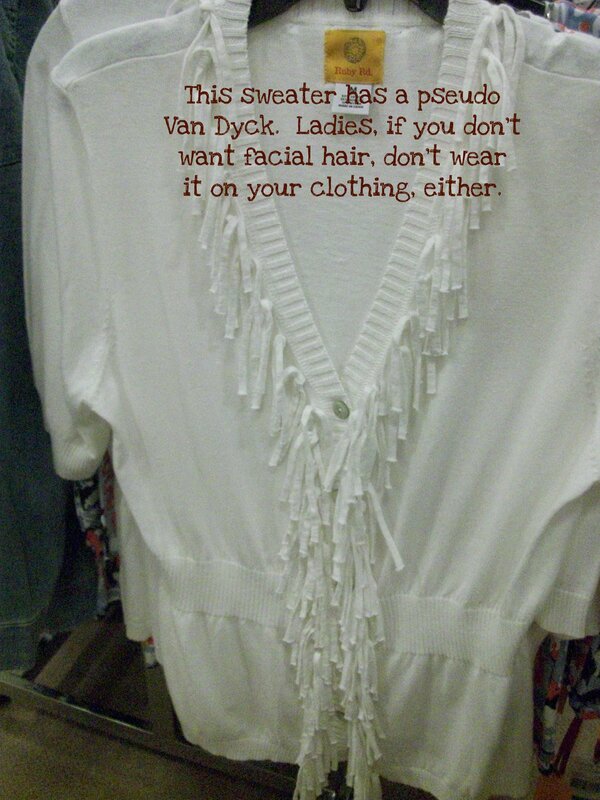 Ladies, don’t buy clothing that looks like facial hair. On further consideration, “Don’t buy clothing that looks like facial hair” holds true for you menfolk, too. 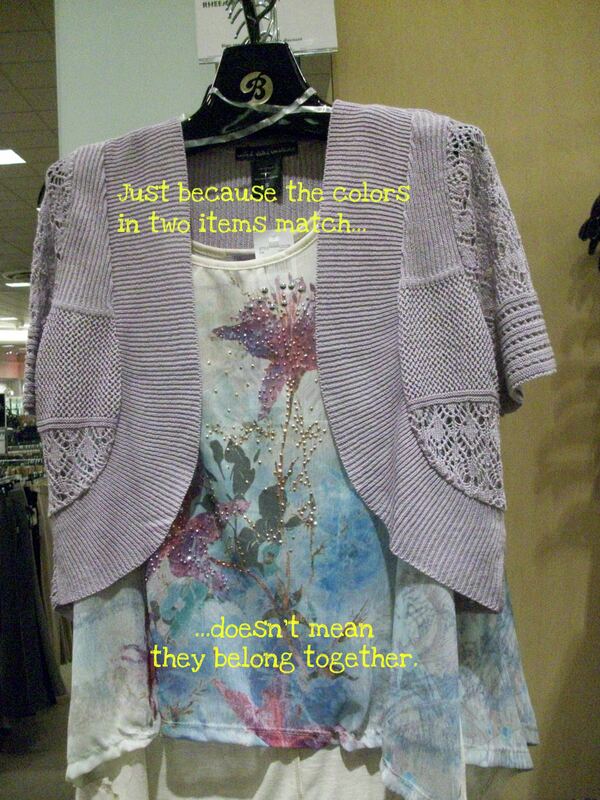 The following shirt/sweater combo is a great example of why things don’t have to match but rather, they have to go. See? The colors technically match but the overall execution and design, when seen together? Dreadful. There oughtta be a law. How about you just feast your eyes on this little beauty? 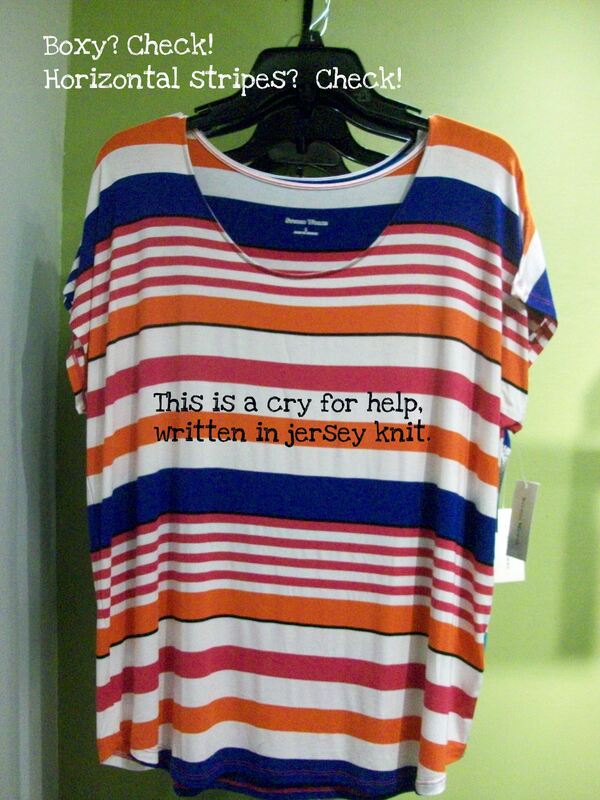 This shirt actually–legitimately–hurts my eyes. 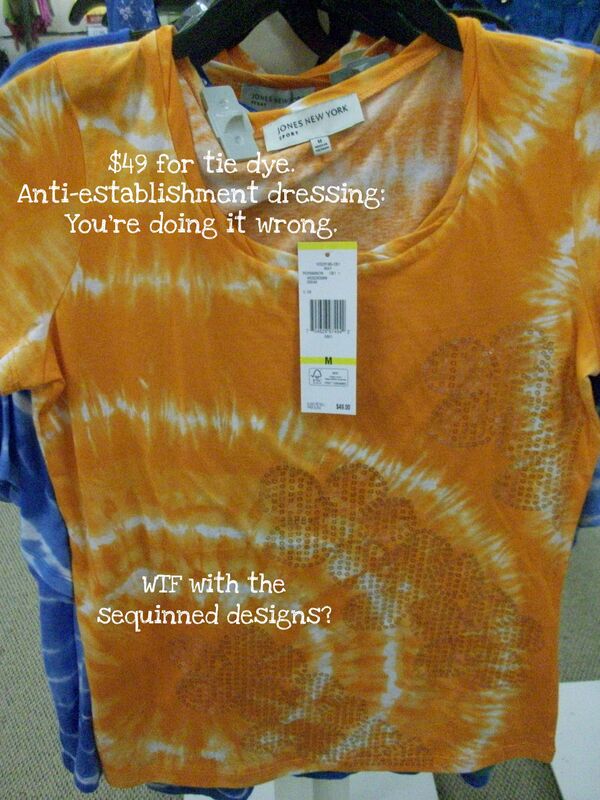 Lord knows I am not a fan of tie-dye, but Jones New York should relinquish any claim they hold to tie-dyed fashions. Stop it. Right now. Collars have become over-embellished to the point of ridiculousness. This collar is far too weighty for the apparent lightness of the shirt. It’s like they’re not even trying with this one. Dresses and long skirt/shirt combos offer little in the way of put together, easy dressing. This one nearly works. 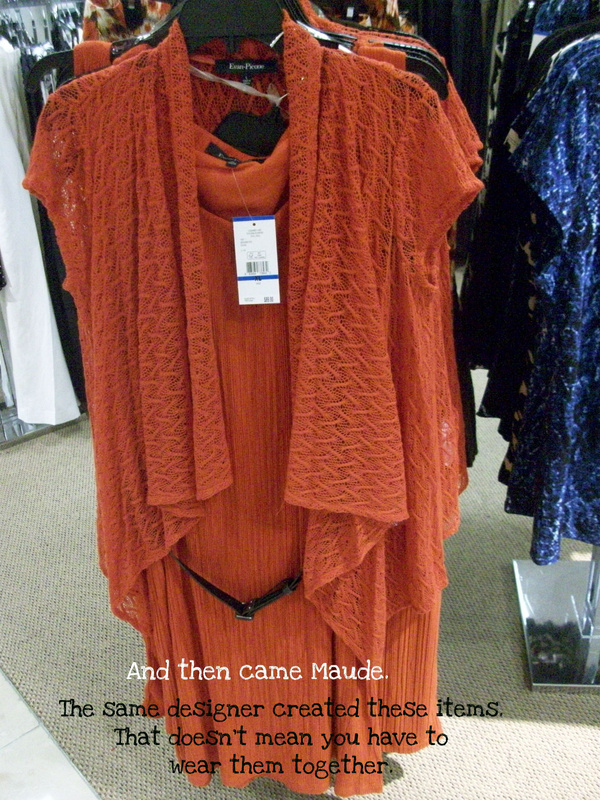 Except the flowy dress and top sweater make it look matronly, like Maude. Who is Maude, you say? 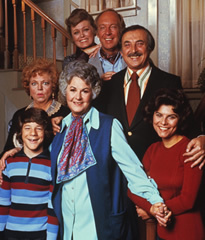 Bea Arthur, TV show, mid-to-late ’70s. Look here and here for further information. I have vague memories of liking the show and can still sing snippets of the theme song, but was really struck by Maude’s sense of…style. 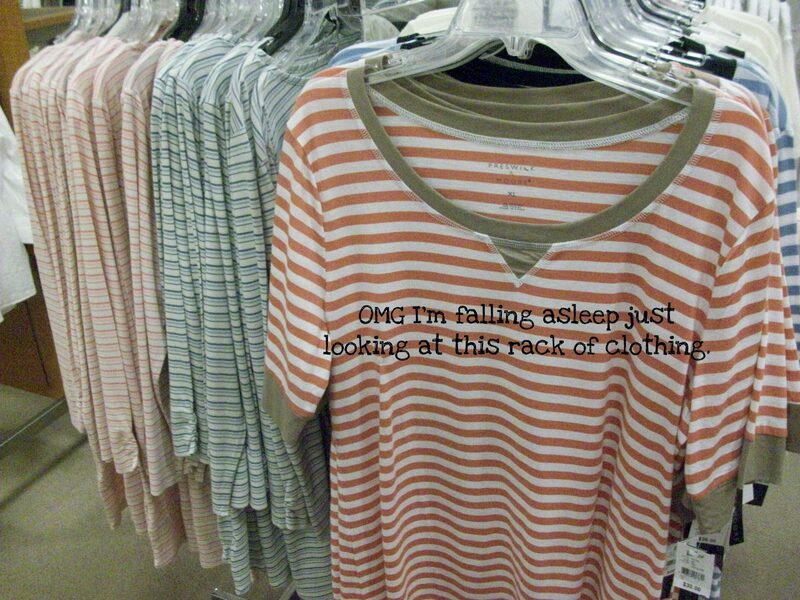 This would have totally gone in her closet. This one almost works. Almost. Except it doesn’t, because of the weird juxtaposition of incompatible textures. Through all this, I kept coming across one particular design trend. 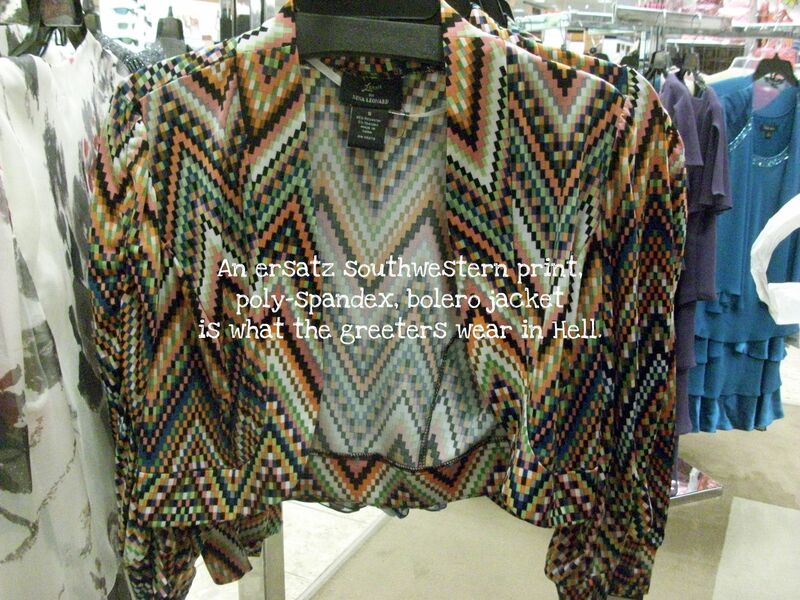 The stores are currently flooded with ill-conceived southwestern-inspired prints; so much so that I fear it could drive a settler to jump from the nearest butte. The one on the left is great for when you want to sport that faux-poncho look. 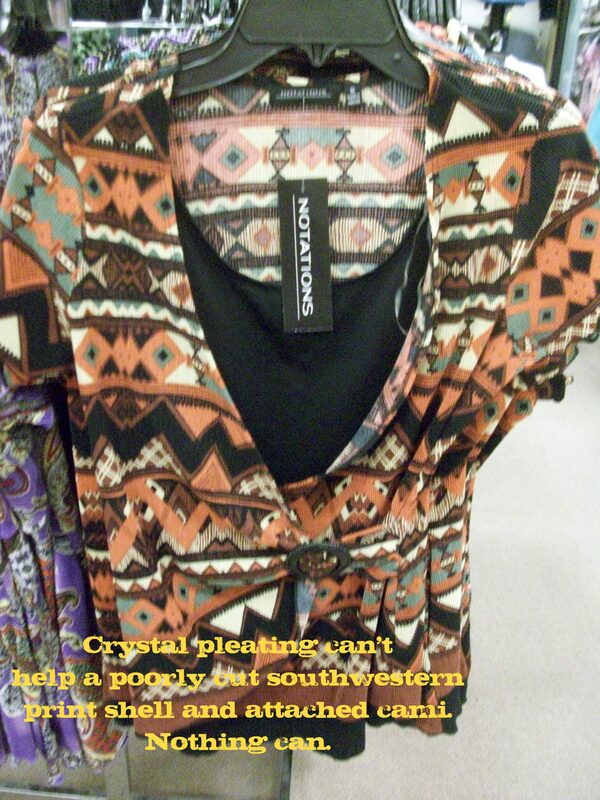 Don’t buy something that’s drooping off the hanger, as the above shirt seems eager to do. 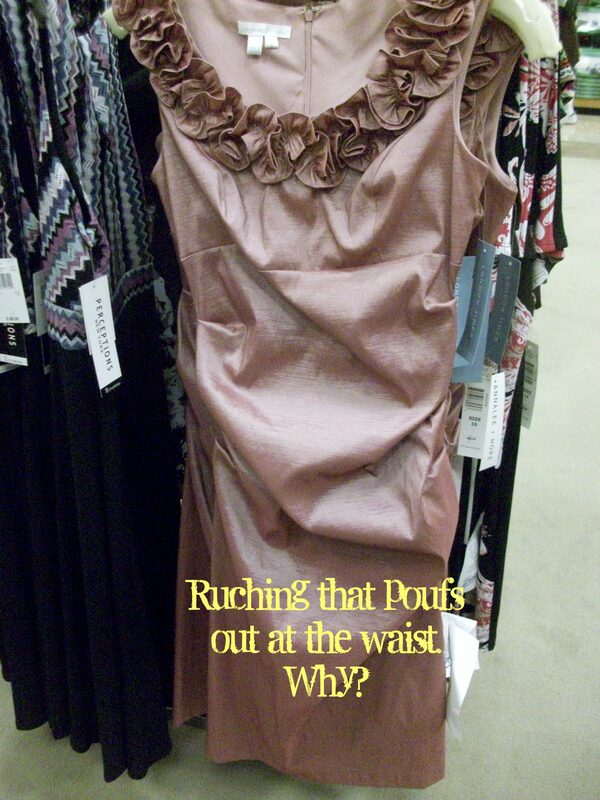 For future reference: don’t confuse drape with droop. 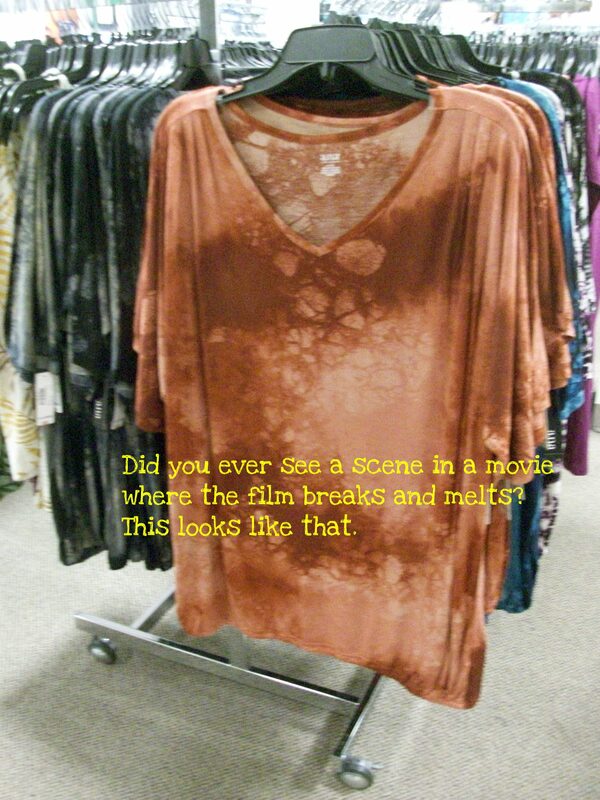 Drape is the arrangement of an article of clothing so that it hangs correctly off the body. Droop is what you get when the material is fatigued and and can’t retain its intended shape. I would advocate killing this jacket with fire, but I’m more concerned with the toxins this could release into the atmosphere. We co-opted the sacred symbols of the indigenous people of the American southwest for this? We should be ashamed. 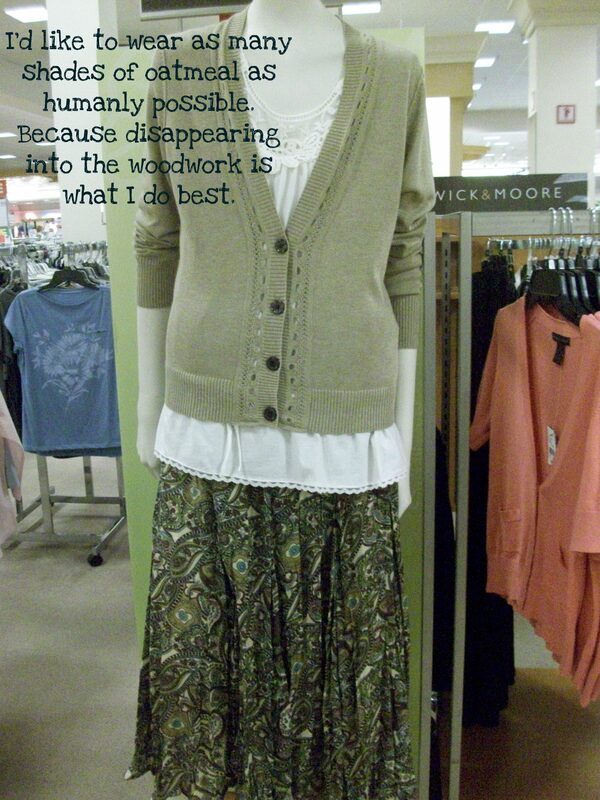 Ladies, take back your rights, stand firm, and no matter what, don’t buy ugly clothes. 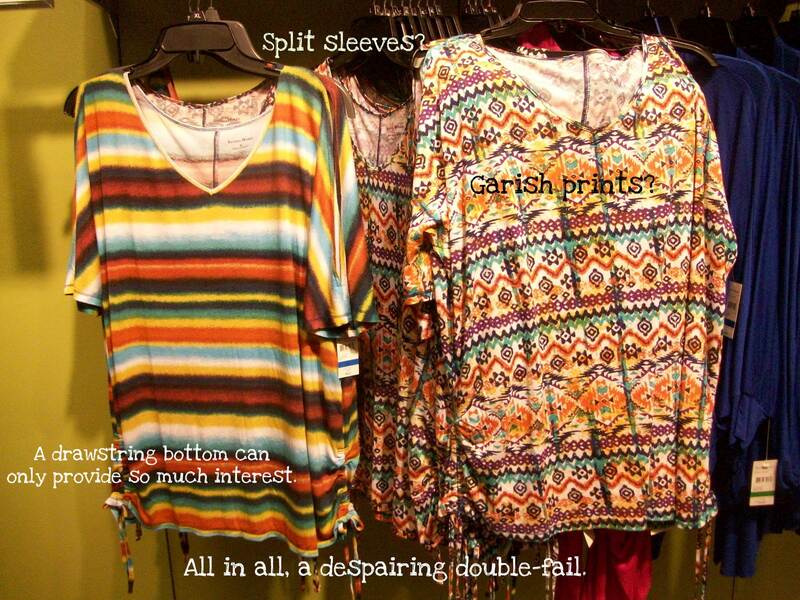 Life is too short to wear scrublike blouses and drooping shirts and frumpy oatmeal cardigans! Go for the fabulous…in everything you do. You deserve it. The only thing I could possibly add: that recurrent shade of orange! Owwwww! Steer me clear of the mall til it’s over. Yay! I’m a winner! A winner! Sorry about the keyboard (but not really). 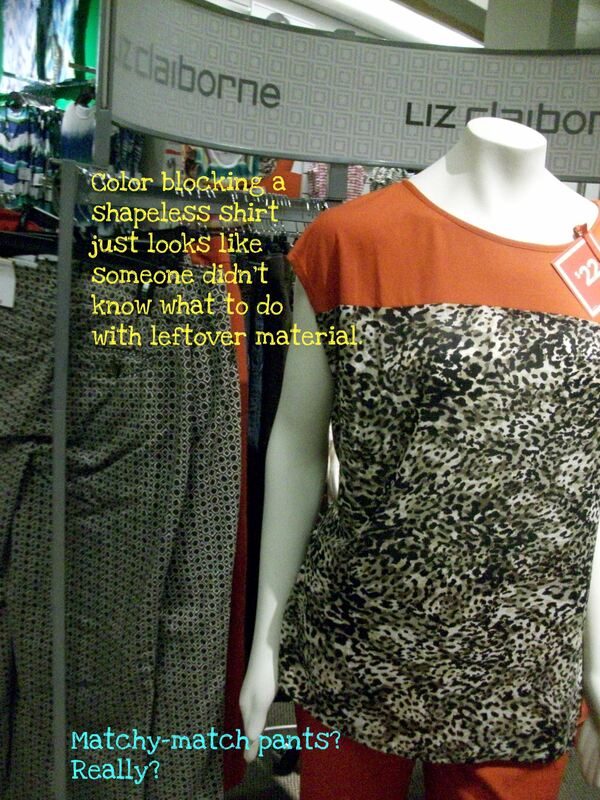 I used to do window and mannequin displays. This is a nightmare. Maybe the buyers are all plotting to make themselves look good by keeping the nice clothes for themselves and putting the bad stuff in the stores? I don’t know. I just know it hurts me to the core to see this stuff. Oh, I feel your pain. When you posted your last fashion photo rant, I thought–can it really be THAT bad? And then I went to the mall. You speak the truth. I would suggest you try Kohls. I find their offerings more stylish and definitely more economical. 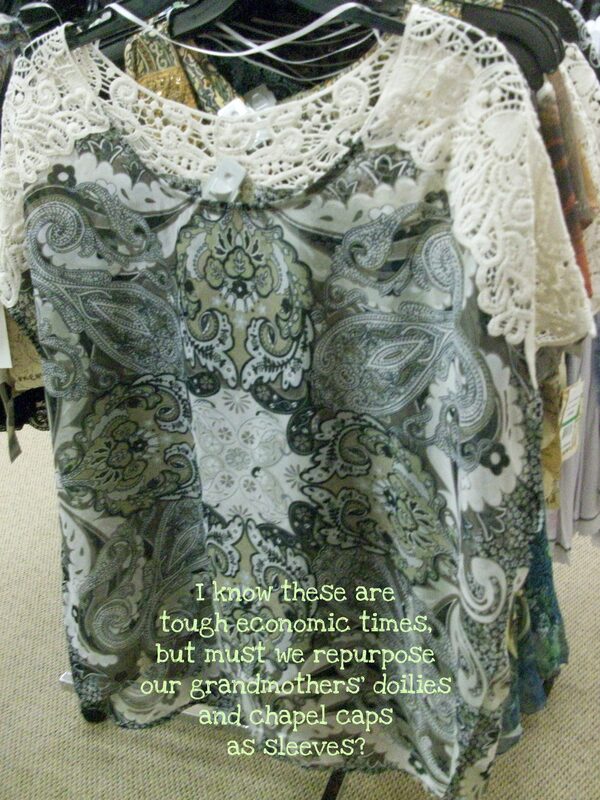 I think Boscovs and BonTon misread their demographic. I do enjoy Kohls. But this wasn’t even a planned shopping trip, this was an unexpected interlude of window shopping overwhelmed by a relentless stream of whatthefuckery. 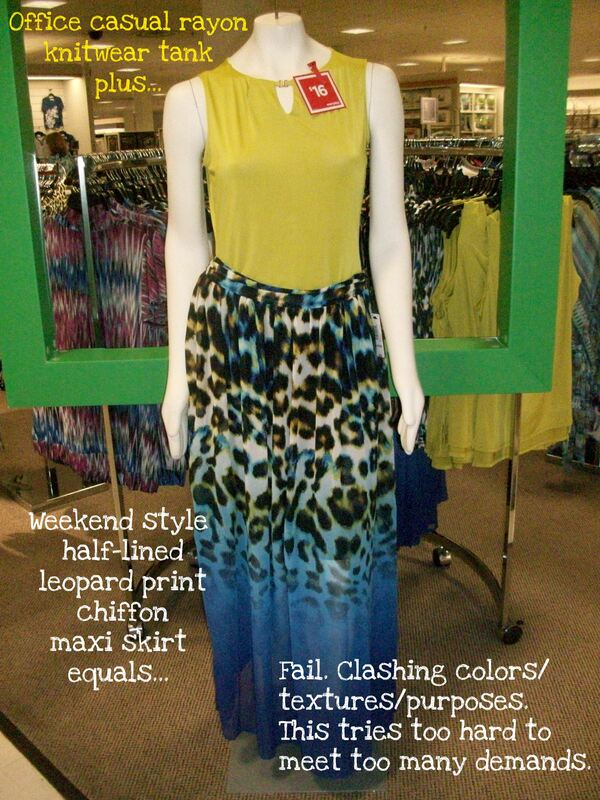 I can’t even imagine what Bon Ton and Boscovs consider to be their demographic. I used to look at some prints and think “does that work? Well a designer created it, so it must in some fashion world, so what do I know?” I’ve since learned better……thank you for reinforcing that and educating others that just because someone is selling it, doesn’t mean its ok! It’s never OK! Don’t settle for unattractive or unappealing! You deserve better! We all deserve to be fabulous! 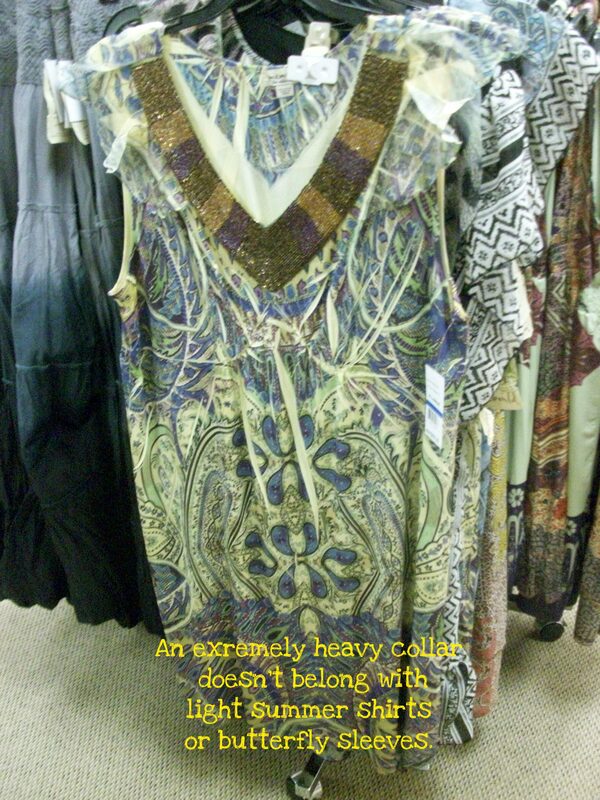 And if you don’t find a print you like, get solids and bling them up with jewelry, or a belt, or a fab purse. Settling for prints you can only just deal with = “I give up” and who needs to do that, ever? The first “I give up” makes it easier to give up again, and again, and again.